2013 Road Trip Notes, Day 6: Though the Hakken-Kraks Howl « Midlife Crisis Crossover! On Day One of our vacation we stopped briefly to view statues in Springfield, Ohio. Today we stopped to view statues in Springfield, Massachusetts. Together they make interesting bookends, particularly since one of today’s attractions was a sculpture of a book. 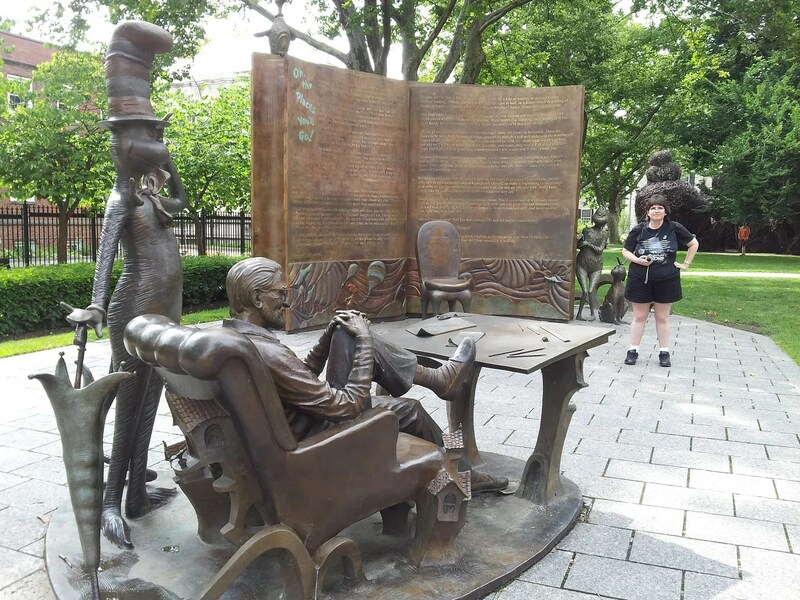 Located centrally between a clutch of museums and other notable Springfield organizations is the Dr. Seuss National Memorial Sculpture Garden, a modest park with one life-sized sculpture of the greatest author/illustrator from my early childhood, along with several characters from his most memorable books. Offscreen but present in spirit and metal were Horton, Thing One, Thing Two, the Lorax, and more. Dr. Seuss himself is seated above at his writing desk with the Cat in the Hat as his companion and muse. Lurking in the distance behind my wife is the Grinch with his unreasonably loyal dog Max. One of the tallest pieces in the Garden is a copy of Seuss’ final book before his 1990 passing, Oh, the Places You’ll Go! Inscribed upon it is the complete text of the book, slightly weathered but no less meaningful to any reader, young or old, who’s ever had doubts about where they’re headed in life and whether or not they’ll succeed. The text is also available online sans illustrations for the curious who’ve never had it read to them, or never had the pleasure of reading it to someone else in turn. In revisiting the story for my own immediate context, it’s a wondrous metaphor for the average blogger’s journey in general and our family’s annual road trips in particular.